Lee was an employee with CERN (European Organization for Nuclear Research) at that time, and even he didn’t know that the proposal he submitted would change the way world communicates and shares ideas. Internet has indeed changed everything! Here are 25 milestones for the World Wide Web which defined the Internet as we know today. 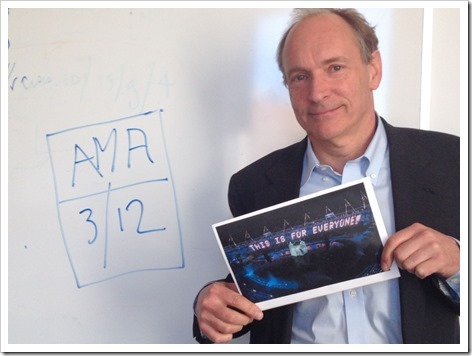 To mark this 25th anniversary of WWW, it’s founder Tim Berners-Lee initiated an AMA session on Reddit.com, which incidentally is known as the “Front Page of the Internet”. AMA or Ask Me Anything is one of the most popular features of Reddit where users ask random questions to the person who has initiated the session. Q: Do you think in the (not too distant) future we’ll look back and think ourselves lucky to have witnessed a neutral, free, and uncensored world wide web? Q: Do you have any ideas about how interface for the web could change in a real, transformational way? Q: Did you ever think that the internet would get this big? Q: where do you think the web will end up in the next 25 years? Q: Who was your role model as a kid? Q: Edward Snowden- Hero or Villain? Q: Do you still have an interest in trainspotting? Q: What web browser do you use? Q: A lot of people think that your calls for an open web are a bit hypocritical considering your support for the HTML5 DRM spec. What would you tell them? A: I would suggest to them the DRM question is not that simplistic. People want to watch big movies. DRM is a pain in many ways, but if you have used Netflix or bought a DVD or a bluray, then DRM is part of your life. I agree DRM is a pain in many ways, and should only be used for very “high value” streams. I also would point out that Copyright, DMCA aand CFAA in the US are seriously broken, and need fixing separate from the DRM question. Actually I would get involved with a very long complicated discussion, as I have already with many people. Not sure we have space here. Other points include the the browsers have putt DRM in — they have to to keep market share — irrelevant of whether the HTML specs make the connection to the web more standard. Q: Did you ever post a picture of your cat? Q: Is it true that error 404 came to be as a result of there not being a room 404 in the office you were working at? Q: What are your thoughts on the increased surveillance on internet based mediums like GCHQ’s monitoring of all the Yahoo video chats. Do you personally think it should be controlled, non existent or fine the way it is now? Q: Have you learned to spell referrer yet ? Q: Given your work at the World Wide Web Consortium and support of Internet decentralization, what are your thoughts on the W3C Web Payments Community Group and their effort to standardize web payments using Bitcoin and other digital currencies (source)? / Q: What impact, if any, do you think digital currencies might have on how value is sent over the Internet? Q: Why does no one mention Robert Cailliau anymore when it comes to the www? Didn’t both of you invent it? Q: I don’t really have anything to ask, i’d just want to thank you. Alright.. maybe one question. What site do visit on a daily basis? Q: An Internet Bill of Rights feels like a nice concept, but even with the right intentions, it also feels like it centralizes power. And the goal of the Web today is to decentralize power. Can you explain how the two might balance? Q: You talked recently about having a “Magna Carta” of sorts for the web. How do you envision that sort of system working? You can read the entire AMA session here .